Two blocks north of the very centre of Oxford runs a wide, tree lined Boulevard called St Giles'. It is owned by one of the richest colleges, St Johns, whose castellated towers flank the eastern side of it. On the west flank stands one of the KMSA's favourite bars, The Eagle and Child, haunt of The Inklings, and this summer the FF's and their Femmes. 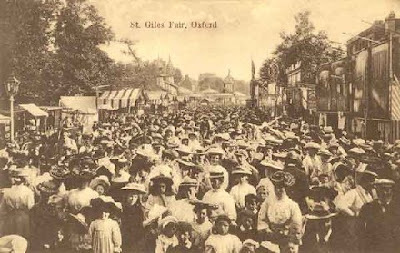 (St Giles' day), St John's allows the Oxford City Council to hold an Autumn Fun Fair along the full length of this boulevard. 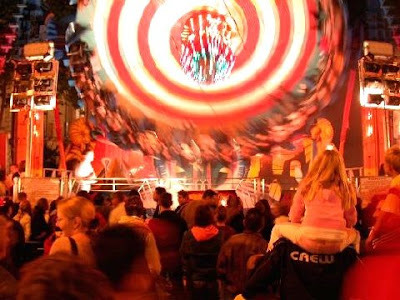 It is unusual for an English fair, being held in a major street of a city and blocking traffic for its two-day duration. The origins of the fair related to St Giles' Church at the north end of St Giles'. This was originally completed in 1120, but the church was not actually consecrated until 1200, by St Hugh of Lincoln, a Cartesian monk and bishop. 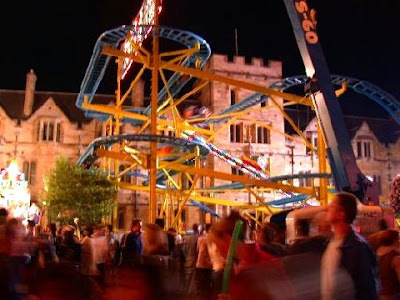 As part of the commemoration of the consecration, St Giles' Fair was established. The medieval fair was held in nearby Walton Manor,then outside the city walls... where it took place in the St Giles' churchyard on St Giles Day and during the following week. Queen Elizabeth I stayed in Oxford between 3–10 September 1567 and watched the fair from the windows of St John's College. Traditionally, anyone with a beer shop was allowed to bring barrels of beer to St Giles' Fair for sale. Another custom was that any householder in St Giles itself could sell beer and spirits during the fair by hanging the bough of a tree over their front door. 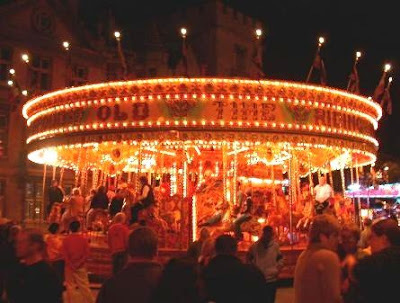 The fair evolved from the St Giles' parish wake, first recorded in 1624, and which became known as St Giles' Feast. In the 1780's, it was a toy fair, with cheap items for sale. 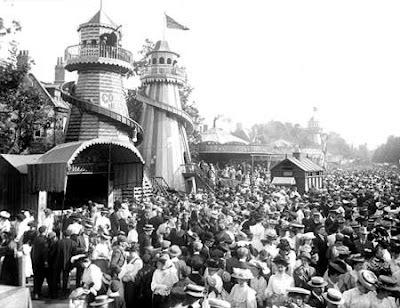 By 1800, it had become a more general fair with stalls and rides. From the 1830's, the fair included adult amusements and it became more rowdy, so much so that there were calls for it to be closed. 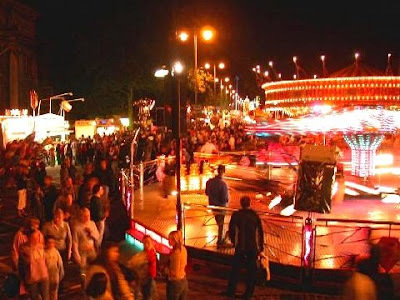 By the Victorian era, with train travel excursions becoming available, the fair was attracting people from places as far away as Birmingham and Cardiff. These days the freak shows tend to be in the crowds rather than Bearded Lady Booths, and the delightful cake-walk and the Whips are still there with the food stalls, the funfair games, Dodgems cars and kiddy rides all supplemented by Bungee's Cranes and Catapults and gaily painted centrifugal equipment that could have been invented and used to train astronauts by NASA. So Tonight, ( Monday) as it was a warm calm evening out, myself and a few pals took to the throng, via the Eagle and Child, and threw ourselves on the heady delights of letting our inner child out, without any of the beer coming up too. What strikes you as incredible is how they cram this much equipment into such a limited space, with the higher and more spidery of the rides flailing us literally within inches of the Plane Trees and the ancient buildings and windows of the surrounding colleges. For me the sights and sounds and excitement of the Fair never seem to change since i was brought here as a child, and while i didn't this year bother to try and win a goldfish off a gypsy, or win a coconut at the Shy,......the delicious beer made us hungry for the Fair Food of Toffee Apples and Nougat Chunks and Ginger snaps, which sent us off happy into the dark night, to the sound of the Carousel Music, and with one of our crew clutching a big teddy bear he'd won for his gal, shootin' Air Rifles. Lovely! 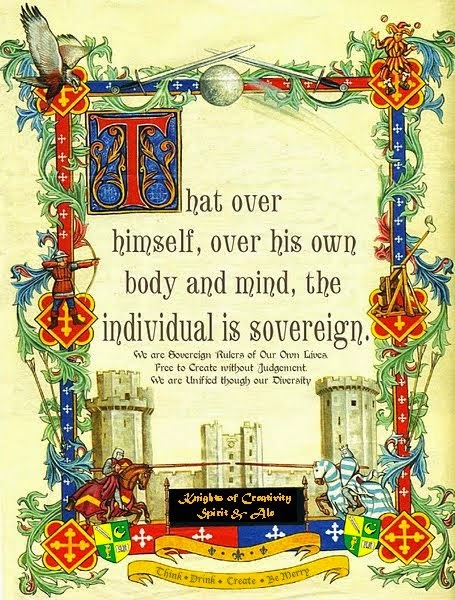 If you take away the Castle look of St Johns College, that could be "Any Fair USA". Always an adventure to release the "inner child"... especially after having a few "pops" at the Eagle and Child! You threw me straight back into the past...yes, it's possible to live there right now! And I thought candied apples where an American thing. Great story, great tradition, great history! Is no one thinking about the large street fair here in Evansville, Indiana? The West Side Nut Club Fall Festival. I shan't give its long history, but instead will offer its website. 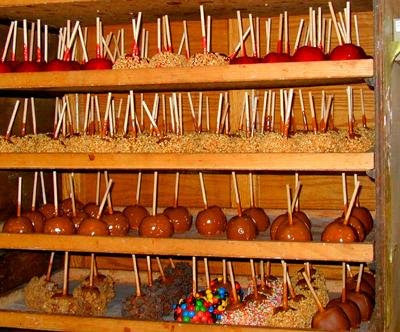 Go forth and have candied apples, pronto pups, corn dogs, deep fried everything. Excellent tour. And yes, I love the line about the freak show now the crowd. I don't know who the hell Steve is (from previous comment). I suspect that it's the last person who used the computer here at the library. Sorry about that. 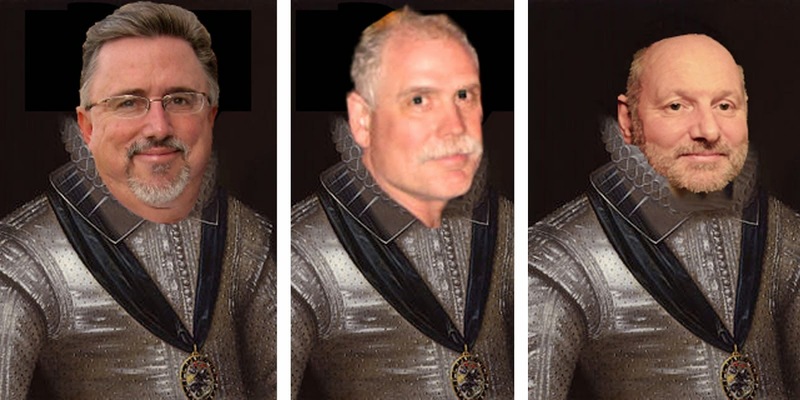 Sir Dayvd ( the fallen Nut ) of Oxford.